wired or wireless remote or sensors are given to update the numbers. We have risen to prominence in the field of Production Information Display. One could deduce from its name that these equipments are ideally suited for the display of the product information. These information display systems are acknowledged for its smooth edges, excellent corrosion resistant nature and portability. 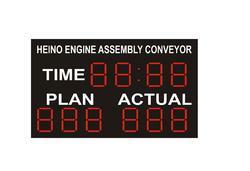 On top of this, these Production Information Displays are available at nominal prices. Looking for Production Information Display ?